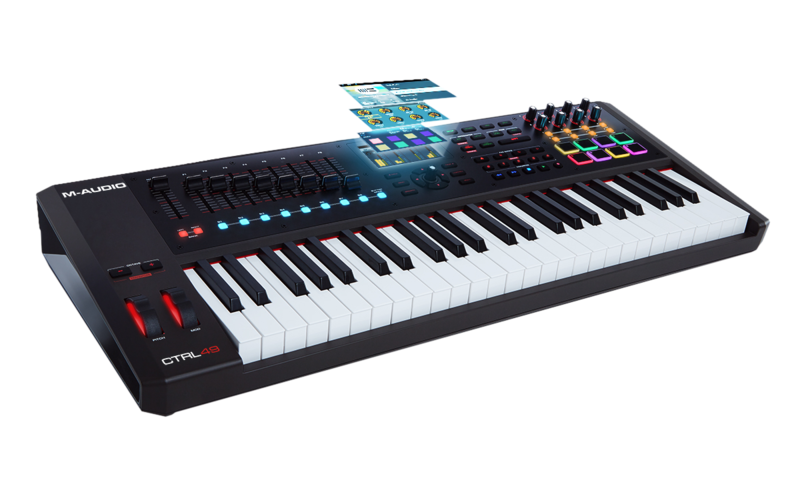 The M-Audio CTRL49 is a full featured USB/MIDI keyboard that comes complete with VIP integration as well as Mackie/HUI control for instant mapping with most DAWs. This guide discusses some common questions. Does the CTRL49 require any drivers? Does the CTRL49 require a power supply? Some of the keys aren't working. Are they broken? My faders are affecting the pitch wheels in Ableton. Is this normal? Can the faders be used in VIP? Can the knobs, switches and pads be used outside of VIP? What if VIP is open and I want to use the knobs and switches with my DAW? Can I use the CTRL49 with my external MIDI gear? Why won't the CTRL49 turn off when I press the power button? What does the Split button do? Is there a user manual I can download for further detail about the CTRL49? Where can I find more information about setting up and using the CTRL49 and VIP? You will find download links for most of the software on your M-Audio account page after registering the CTRL49. VIP, Hybrid, Vacuum Pro, Loom, and Xpand!2 will all be included in a single download. The AIR Creative FX Collection and Eighty Eight Ensemble will be separate download links on your account page. Transfuser and Velvet will be available from your VIP store after VIP has been installed and activated (Select STORE from the main browser in VIP). You can also use the store to download any of the other included plugins, including Eighty Eight Ensemble, and even some complimentary expansion packs for Hybrid (Mark Knight and Rene Amesz expansions). Ableton will be available via download from the Ableton website. You will find a card with download instructions and authorization code included in the box. The CTRL49 will be supported for Windows 7 and up, and Mac OS X 10.8 and up. VIP will be supported for Windows 7/8, and Mac OS X 10.8 and up. The included AIR and Sonivox plugins are supported for Windows 7/8, and Mac OS X 10.8.5 - 10.10. Check the Ableton website to find the compatibility specs for the latest version of Ableton. Yes, there are drivers necessary for both Windows and Mac OS X for integration with VIP. The latest drivers will be available directly on your account page, as well as from the Drivers & Updates page. Yes, the CTRL49 will be provided with a necessary power supply. This is an external, auto-switching 9V 800mA supply. VIP, or Virtual Instrument Player is a unique software interface that automatically maps your favorite VST plugins (instruments and effects) to controls on your keyboard. VIP comes as both a standalone VST player and a VST, AU, and AAX plugin to bring VST control into your favorite DAW. The software was initially developed for use with the Akai Pro Advance series but is now integrated with the Alesis VX49 and the M-Audio CTRL49. For more information on VIP, supported plugins, and other information, check out the FAQ guide. If most of the keys on the keyboard have stopped working, this may be because of the keyboard's setup as a Mackie control surface. If the wrong MIDI port has been assigned to the Mackie control surface input, this may route the MIDI note data from the keys to the Mackie control surface instead of your virtual instrument. Please make sure to use the CTRL49 Mackie/HUI ports when selecting input and output ports for your Mackie Control Surface in your DAW. Similar to the last question, this is also related to Mackie and the ports selected during the set up. If the CTRL49 Mackie/HUI port is activated as a MIDI input, the MIDI data from your faders may be sent to your virtual instrument, affecting the pitch of the instrument instead of the faders in your DAW. To prevent this, make sure that the CTRL49 Macki/HUI port is not activated as a MIDI input for your instrument track. For example in Ableton, this may include turning off "Track" for the CTRL49 Mackie/HUI input port, or in Cubase, assigning your instrument track input as CTRL49 USB, instead of "All MIDI Inputs." Can the faders be used inside of VIP? Press down on the Data Dial (knob in the center of the cursor buttons) to enter the MIDI Edit Mode. Yes! While VIP is closed the knobs, switches (buttons below the knobs on the right), and pads will default to normal MIDI operation. Simply press the MIDI button to enter the MIDI control screen. Continue to press the MIDI button to view either the knobs, switches or pads. While VIP is open (whether in standalone or plugin operation) the knobs, switches and pads will automatically default to communicate with VIP. But, you can quickly exit VIP mode and jump into MIDI Mode by simply pressing the MIDI button. Press the Control button to return to VIP control. You can continue to play your instruments in VIP, even when in MIDI Mode. To send MIDI directly from the keyboard to the MIDI Output port, press the GLOBAL button to change the Common Channel to B1-16. The A channels are for USB, the B channels are for the MIDI Output. You can also use the MIDI Edit mode to assign specific paramaters to be sent out of a B channel to the MIDI Output port. Route MIDI data from your DAW or other midi software to the MIDI Output port by choosing CTRL49 MIDI as your output port. For example, you can create a MIDI track in your DAW with CTRL49 USB as the input and CTRL49 MIDI as the output to route all incoming MIDI data from the CTRL49 back out to it's own MIDI Output. To power off the CTRL49, hold down the power button for about 3 seconds. This works as a precaution to prevent accidentally powering off the keyboard. The SPLIT button is a quick way to access a VIP feature that allows you to split the keyboard between different plugins in your VIP multi. This works a little like the classic split or zone features found on many keyboards, except without the need to use different MIDI channels or additional routing. Simply press the SPLIT button and use the Lo Key and Hi Key options to change the range of keys you'd like for the particular patch. Use the cursor buttons to select the different options and the data dial to change the value. Press the SPLIT button again to cycle through and select the next multi slot. Remember to check back regularly for new articles! If you don't see an article or tutorial for a topic you are interested in, let us know by submitting a feature request through our M-Audio Community Forum or by sending us your Customer Feedback through our Support Contact Form.